What’s an occasion if it’s not marked with something sweet? Of course, Christmas time saw the typical cohort of creative twists on festive classics, like salted caramel mince pies and a prosecco panettone. And now that we’re steaming towards Valentine’s Day, Pancake Day and Easter, we can’t get enough of a treat here and there. Easter eggs, salted caramel hot cross buns, pancake drizzles and Cadbury’s Crème Eggs – just a few of the sweet treats that make this winter drag a bit more bearable. And now one supermarket is bringing us a new edition of one of our favourite sweets – and it’s dedicated to a pretty fun occasion. High-street food store Marks & Spencer has released a special edition of their classic Percy Pig sweets in celebration of the Chinese New Year. This year’s Chinese New Year, which takes place next week on Tuesday 5th February, will be in celebration of the Year of the Pig. 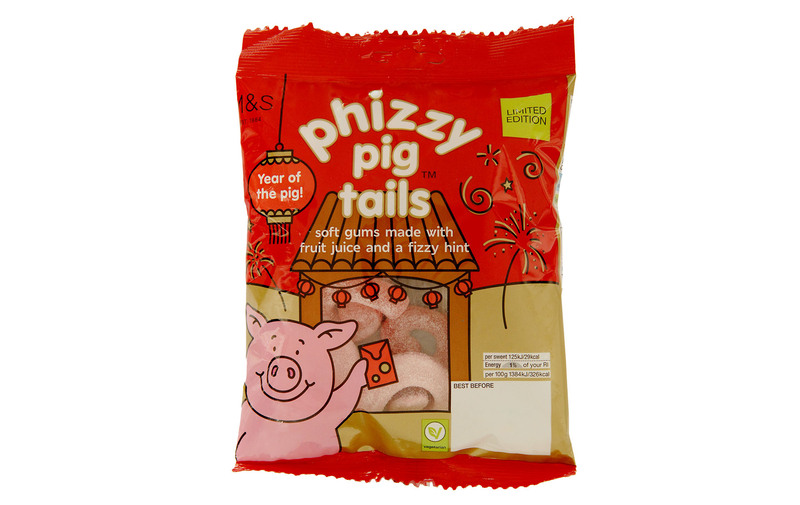 And in that spirit, the high-end supermarket has released limited edition packets of their Percy Phizzy Pig Tails. The Pig Tail version of the iconic Marks & Spencer mascot is made with the usual berry fruit juices but comes with hint of sourness and is coated in sugar. You can get your hands on the delicious sweets in Marks & Spencer foodhalls and food departments across the country and they come in at only £1.65 for a 170g bag. Or if you head down there soon, you can take advantage of their offer to get two bags for only £3. ‘We couldn’t celebrate the Chinese Year of the Pig without paying homage to the nations favourite pig,’ said Katy Patino, Product Developer at M&S. We’re off to stock up!